The talents of Hiromich Sasaki are underused at this Logan Square BYO. From top to bottom: Crabby Wasabi, Hot Yogi, and Pike Place maki. Editor's note: Wasabi has moved to 2115 N. Milwaukee. Wasabi opened in mid-December with a yawn. Now Chicago has yet another mediocre all-in-one restaurant offering Japanese specialties—sushi, small plates, yakitori, katsu, ramen, donburi, tempura, teriyaki—but specializing in nothing in particular. The lifelessness is apparent the moment you walk through its front door. On arrival, we were greeted with a forced smile from the hostess and a wan look from head sushi chef Hiromichi Sasaki. Wasabi's website boasts that Sasaki is one of Chicago's original sushi chefs. And indeed, a more natural setting for this elder statesman might be a traditional spot like Sunshine Cafe or Ginza Restaurant. There's something highly unsettling about watching a distinguished Japanese chef roll a Hot Yogi maki. Standard nigiri staples like yellowtail (hamachi), tuna (toro and maguro), and sea urchin (uni) were, at best, not unfresh. The vinegar-saturated mackerel (saba) looked weepy and possessed a pungency that pushed way beyond the fish's natural strength. Tamago (egg omelet) is typically thought of as an indicator of a sushi operation's overall cooking capabilities; Wasabi's attempt had the delicacy and finesse of diner scrambled eggs. 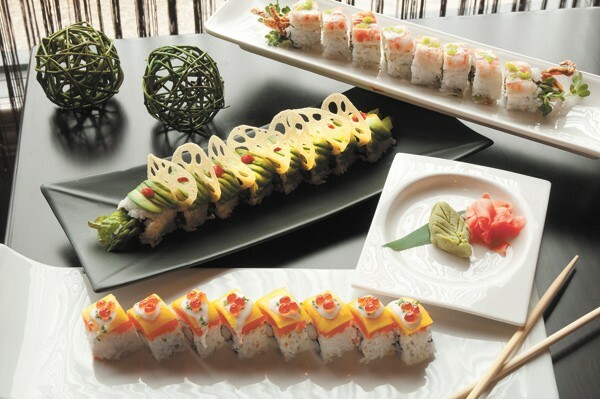 Signature maki rolls such as the Crabby Wasabi (fried soft-shell crab, shrimp, kaiware, avocado, wasabi mayo) and the Cubby Bear (escolar, eel, crab salad) are essentially frittery mayo bombs. A special listed as Kobe aburi (glazed, lightly seared beef nigiri) was an annoying example of socially acceptable fraud. (In April 2010, it became illegal to import true Kobe beef from Japan.) Though the $5 price tag hints at its inauthenticity, all doubt's removed when you take a bite of the sinewy, too sweet meat. Another house special, the ankimo madako (monkfish liver wrapped with octopus and shiso leaf), would never be mistaken for the foie gras of the sea. Chicago's dire need for a legitimate ramen shop is unfulfilled by Wasabi. Haphazardly constructed, the miso ramen had a thin one-dimensional broth, mushy standard-issue noodles, and a rubbery, off-tasting molten egg. The only saving grace was the chasu (sliced Berkshire pork), which was nicely seasoned and succulent. And I'm not sure why Chicago restaurants like Wasabi have the balls to charge at least $13 (for a bowl of second-rate ramen. Setting aside upscale Ramen Ippudo and Momofuku Noodle Bar in New York City, I'd be hard-pressed to name any serious ramen maker charging more than $10 for a bowl of noodles anywhere else in the U.S.
A few dishes were worthy of recommendation, notably fried items and dishes made with Berkshire pork. The fried chicken and kimchi-pork spring rolls make for decent drinking food—though the restaurant might consider loosening up a BYO policy that currently allows only a bottle of wine or a six-pack per every two diners.